Here are 3 necessary personality development tips. You see, your personality determines how you relate to other people so it’s important to get some juicy vibes happening in that personality of yours. Your personality was formed throughout your childhood experiences. Since you were a child your thoughts, beliefs, attitudes and feelings were influenced by your family, friends, other people such as doctors and teachers and the environment. So you have this Template for Living and that forms your personality. Your personality patterns have become so familiar to you over the years that it’s difficult to imagine something different, BUT if you don’t like bits of your personality here are 5 important personality tips. 1. When your personality goes into a state of sadness in which you feel hopeless and that nothing will change in your life you need to activate HOPE. Adding a bit of hope to your personality patterns will do wonders for you! You see, when you add hope you feel good about the future. You visualise a positive future and hope that it will come true. This visualisation makes you feel good inside and boosts your personality quirks into positivity. 2. If you’re feeling frustrated with life has offered you then you need to switch this over to feeling grateful for what you DO have in life. The positivity vibe of gratitude takes you out of that frustrated down side of life and flicks you over into a feeling good about life vibe. It’s awesome and easy to do. Write down 3 things that you’re grateful for each night before going to bed. Do this for 21 days. 3. The last personality development tip for today is to realise your self-worth. No one in the world is exactly like you. You are unique and special in your own perfect way. When you know your worth you automatically flick your personality into feeling good – and this changes how you relate to people. It’s amazing how a low self-worth can really knock you around every day – without you even know it. Soooo, take some time today and write down all the good things about yourself. Write down every little and big accomplishment, what you like about your personality, your strengths and what you’re good at, and so on. 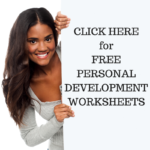 There are many personal development tools and I recommend checking out these online courses to help you boost your personality even further! This entry was posted in Personal Development Resources, Personal Development Tips and tagged personal development, personality development tips. Bookmark the permalink. Previous Post: How to Get Motivated to do Anything!